When someone buys a dilapidated property so that they can fix it up and flip it, you may be hired to inspect a property that is in bad enough disrepair that parts of it are actually dangerous. While it is very rare for a good property inspector actually to be injured during an inspection, being aware of some of the more dangerous situations in a run-down property and knowing how to deal with them can help you keep yourself safe, and will help the property owner figure out how to remodel the building safely. Two very common hazards of a building in disrepair are frayed electrical wiring and damaged gas pipes. If you think there might be exposed wiring in the building, make sure that the main electrical and gas supplies are shut off before you begin your inspection. Even though it is standard in inspections to test electrical fixtures, making sure the outlets work is much less important than being sure you do not electrocute yourself or start an electrical fire. Properties built during certain periods used building materials that can be very harmful if they are inhaled or consumed in any way. For example, during the early 20th century asbestos was commonly used as insulation, and many old buildings still have asbestos insulation because the process of removing it is expensive and can be very dangerous. Knowing when the property was built will give you a good idea which dangerous materials were used in the building, and which you should protect yourself against if there are particles in the air. If you’ve built your reputation on doing the most thorough property inspections in the business, it can be tempting to push aside that rusty pipe so that you can get a good look at the baseboards. But if there’s a risk that the pipe will break and the beam it’s supporting will fall on you, don’t do it. Never deliberately put yourself in a situation that might be dangerous: be honest with the property manager about what you cannot reach, and keep yourself uninjured for a second inspection on another day. 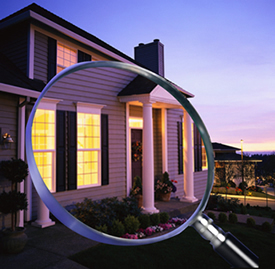 If anything about the property you are inspecting looks dangerous, make sure that someone knows where you are. If you and your team are using a property inspection app it is easy to keep track of each other’s schedules; otherwise be sure that at least one member of your team has the address of the property you are inspecting and knows how long you expect to be there. That way, if something does go wrong, you know that someone can find you and help you.